My name is Kay. I was raised in rural Indiana. I went to college at Purdue and received my Ph.D. from Texas A&M. I live in Illinois with my husband, Tom. For most of my life, I taught. First, high school English, then elementary reading. Then I became a professor and taught undergrads and graduate students. Tom and I have started some serious travel: India, Germany, Austria, Vietnam, Cambodia, Honduras, France, England, Wales, Scotland, Mexico, and Canada. Thank you for reading my blog. I write stories from our front porch and beyond. Please leave comments. We’d love to hear from you. To get here, just turn left on Walnut. I enjoy the pace of things on your blog, the small town feel, almost sepia tinged. The photo of the pickup full of corn smelled so sweet. Thank you kindly, Jeff. The pace matches me, I suppose. The corn tasted better than my amateur shot of that old pickup. Thank you for stopping by my blog. I do appreciate it. Hiya, Thanks for dropping in on my blog, Photographic Memories, I hope you enjoyed it as much as I’ve enjoyed my return visit. You are an awesome photographer. I am humbled that you even look at my photos taken with my phone. Thank you for visiting my site. I look forward to following yours. I’m looking forward to following yours, too! You left a comment on my blog (to which I also responded). I used to live in Kent (19 years!!!). Do I know you? I am embarrassed to say that I may know you but may not remember. Kay. Kay. Hmmm. My memory is bad. It’s so bad, in fact, that I can’t remember where streets are any more, streets whose names I used to know very well. I could give directions like nobody’s business. I am also new to blogging and I am enjoying it. I will catch up on your posts. It will be nice to keep up on the happenings around that town which I loved for so long. I’m not from Kent, but the towns are quite similar, as, I suppose, many small college towns in the midwest. I look forward to following your blog! I suspect small college towns in the midwest are quite similar. I’m looking forward to following your blog, my friend! Thank you kindly. I’m going to find my way back to your blog to make sure I press “follow” this time. I’m so glad that you stumbled upon my blog so that I can, in turn, enjoy yours! It’s an amazingly huge world, the blogosphere, (is that how you spell it?!) and I’m always happy to be directed to a new site to peruse. I loved your post about the city band…we have one here, too, in my small MN town. And yes, the average age of the audience is 70! Such events are a part of America that I hope always remain. I hope to connect with you again! I’m still learning about blogging. What a gift to be invited I to the lives of others, even virtually. I look forward to following your blog. I’ve read several of your posts. They are lovely. The details you share bring your reader right there with you. Thank you. I’m glad you stopped by! Finally put you on my blogroll. It takes me a while to accomplish these things. Yes, I know what you mean about taking a while to accomplish stuff. Then, add issues of blog navigation and it’s a wonder any of us connect at all. I’m humbled that you would put me on your blogroll. I went to your site and even figured out what that means. Thank you kindly. I’m notifying my favorite bloggers one by one, since I couldn’t figure out how to get links to work (I’m technically challenged) – You’ve been nominated by me for the Versatile Blogger Award. If you want to take advantage of this dubious honor… Write a post that mentions notquiteold as your nominator, nominate 15 other posts (a lot I know) and tell your readers seven things about yourself that they may not know. Congrats, and I love your blog. I’ve dawdled in getting a post up and so I suppose the world now has a newly named Versatile Blogger already. The award came with a shiny new car, I bet. Well, @notquiteold, I’ll try to post something anyway and see where that goes. I can’t tell you how much I appreciate your nomination. I’ll try to live up to your nomination anyway, my friend. Thanks for stopping by my blog- hope to see you again! Where in the midwest are you? Hey Lefties. As followers of my blog, I invite you over as presents are under the tree. Hello! Came across your site the other day. I love your content and I am a fellow lover of old homes and slow paces. We are currently looking for our next “old home”. We’ve lived in this new one too long and it doesn’t suit me. Anyway I stopped in to let you know I have nominated you for The Versatile Blogger Award. I hope you’ll accept it. Thank you! I’ll need details, but I’m flattered to be nominated for anything. I found your blog through Gretchen who tagged you. I enjoyed your light box post day one. Fun. I look forward to following more posts. Thanks for stopping by my blog, and what a pleasant little nook you have set-up here! And what a charming moniker! Kay, I confess that it’s been FOREVER since I’ve popped over here. Thanks for stopping by recently. I like your new layout–very clean. I had to go through some old posts to make sure it was still you even though I recognized your photo. I just started cycling again, but I feel like I’m only trying to cycle, not really committed in a way that gets me more in shape and ready for longer rides. Your goals inspire me, however. I tend not to have particular mile-goals because if I don’t accomplish them, I beat myself up. I like to be flexible with myself so that enjoyment is the primary result. Still, I may try to tackle teeny tiny goals and see how it works. Your blog is looking great! I’ll have to catch up on the photos from India. It’s nice to think this could happen to me after my kids are all grown up! Thanks for visiting my blog a few weeks ago. I’m catching up, and was immediately envious of your trip to India. As someone who studies and teaches religion, I’d love to go. Other cultures can be much more social and communal than individualistic America. Hello Kay and Tom. 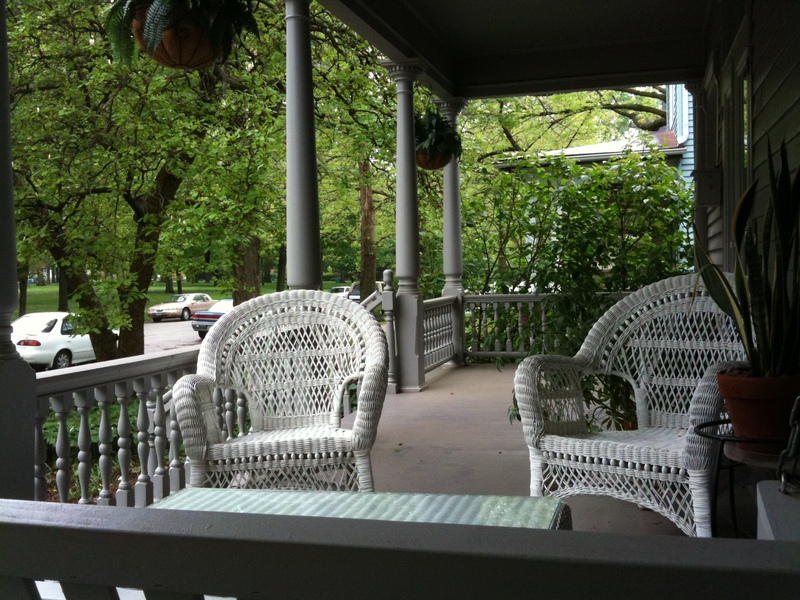 So nice to sit on our old porch swing again and look at the park view over your lovely wicker chairs. You certainly were the right people to buy our big old wonderful house. Keep up the good work. We’ve been enjoying the winter aconite blooming away when we pass by.